My search for a dupe of Chanel Distraction 549 ended! At first, I found a pa nail polish in Japan that looked very much like the Chanel nail polish in color; a very warm pink and coral-like. It is part of the normal pa nail color line, number A92. pa nail polish in A92, costs around 400 yen. While browsing in the Sasa store in the Citygate outlets in Tung Chung (close to the Hong Kong airport), I managed to find another nail polish that is a lot more similar. It was my last day in Hong Kong before going back home, so I felt really lucky. In this small Sasa outlet store, they have a tower, in which they store all kinds of nail polishes in large bins. Among all the bottles in there, I managed to dig this one up, the Sasatinnie mini nail polish SPR209. 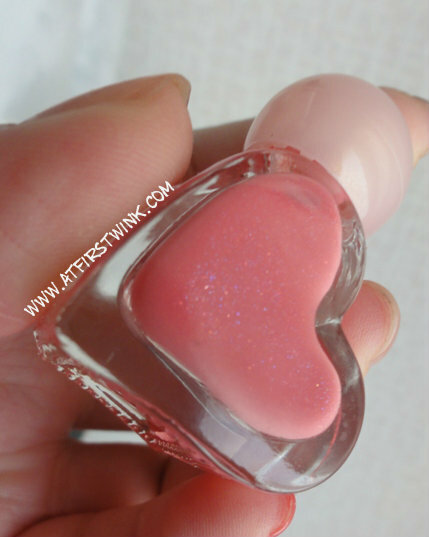 It has a very small, heart-shaped bottle with a large pearl-like cap. It is exactly the nail color that I wanted and it also has a slight pink shimmer in it. I only paid HK$15 for two Sasatinnie mini nail polishes. Sasatinnie mini SPR209, with pretty shimmer. The sasatinnie mini SPR209 on my pinky. You can find more swatches of the Sasatinnie mini nail polish SPR209 over here. If you interested in seeing what other Sasatinnie mini nail polishes I bought, you can go read this post.